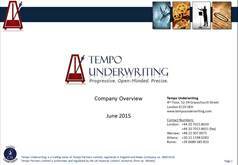 Szymon joined Tempo in the middle of 2014 and is responsible for underwriting Professional Lines business. Szymon joined Tempo from STBU, one of the largest insurance brokers in Poland. At STBU, Szymon provided professional lines insurance solutions to a range of mid-market and corporate clients across different industries. Szymon is currently working towards his ACII.